Apologies for this rather long post and indeed its rambling nature. It feels like weeks now since I've thought about much physics. Things have been so frantic organising for China that I really haven't had much of a chance. I've been reading the title of the newly submitted papers to the arxiv but that's about it. The arxiv is both a hugely invaluable tool and a great time waster simultaneously. People affiliated to physics institutions can upload their papers they've written without any external revue. This makes it very easy to disseminate information and new findings. Generally in the section that I try and keep up with there are around 20 new papers each day. The title and absctract of each one is shown and even if you don't read them, you can get a pretty good idea of what are the hot topics. Anyway, I went back to Southampton on Thursday to hand in my hard-bound thesis and finally get a piece of paper confirming my status as Doc Shock. Every Thursday in Southampton there is an internal seminar within the high energy physics group. This Thursday was a particularly good review of some of the physics that may be discovered in the next couple of generations of particle accelerators. I thought I'd give a brief overview so stop reading now if you're not interested in the really exciting prospects ahead. 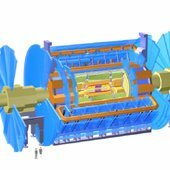 In 2007 the next generation of particle accelerators is due to be turned on and in the following years will be taking measurements of particle reactions which have never been studied before. The idea is that by colliding particles with greater and greater energies, we can view the workings of the universe in evere greater detail. The current model of particle physics is known as The Standard Model and is itself astounding. For the past 30 or so years, we have been testing its predictions of how three of the four forces of nature (The electromagnetic force, the weak force and the strong force) affect the matter particles that make up the universe we see around us (plus other exotic particles which are not present at low energies). The astounding thing is that so far it has given correct predicictions for every test we've been able to thow at it. Even though it has given correct predictions, we know that it can't be the final theory of everything. This is partly to do with the particle which gives mass to all of the particles in the universe: The Higgs boson. This particle has never been seen but its existence was predicted in the 1960s. The problem is that when the quantum properties of the standard model are studied, the mass of the Higgs boson is found to be immense (in fact in physics speak its mass is said to be divergent and is related to energy scales far higher than we are ever likely to be able to probe). Its mass is many, many orders of magnitude higher than any of the other particles in the standard model and this problem is known as the hierarchy problem. I'm fudging and glossing over the details a lot but just want to get the idea across that the theory gives some pretty strange predictions....unless...some mechanism is introduced which can stabilise the mass of this particle. I'll get onto this mechanism shortly but the Higgs boson is the first thing that people hope to see when they switch on the LHC (the particle accelerator out at Cern in Geneva) in 2007. Incidentally the LHC is HUGE. The accelerator is a machine with a circumfrence of 27km. It will accelerate particles to nearly the speed of light and will have a power consumption of 120,000,000 Watts. The largest detector in which the particles will collide and the interactions studied is the most complicated machine ever built. It is a piece of electronics, phototubes, complex materials and magnets the size of a five story building: I worked on this detector for a while at Oxford university and it's also one of the biggest political hot potatos physics has ever seen! Anyway, there are a few contenders for how the mass of the Higgs boson may be stabilised but the main contender is Supersymmetry. This is a symmetry relating particles with different spin. Symmetries are one of the most important concepts in particle physics. All of the forces of nature are understood in terms of an area of mathematics known as group theory which is related to the study of these symmetries. For a good overview of symmetries, John Baez website is worth a look. The main property of supersymmetry which is relevant for the LHC is that it predicts a large number of extra particles. The point about all of this is that the energies which were reached in the previous generations of particle accelerators were just below the level at which the Higgs boson and these supersymmetric particles would be seen...we think. It may be that when the LHC is switched on and the data is analysed we don't see any of the expected signals. It may be that we've been going down a blind alley for the past three decades and suddenly we need to rethink our theories completely. Either way it will be a fascinating time because even if supersymmetry is seen, there are an infinite number of possible scenarios which we will need to pin down. Though the standard model makes predictions for three of the four forces, it is a strongly held belief that really all four forces should be explained by a single, underlying theory. The main contender for this theory is what I base my work on and is known as string theory. I'm not going to go into string theory in any detail now but will say that it is a hugely complicated theory of particles and interactions which we only understand on a rudementary level. Saying that, our understanding is increasing all the time and breakthroughs (however small) are being made frequently. The theory predicts that what we think of as point particles are really tiny oscillating pieces of string. The theory allows the unification of gravity and the other three forces in a very natural and elegant way though for the theory to be mathematically consistent it must be formulated in ten dimensions, where six of them are curled up into some complicated structure. There is a chance that if the universe is set up in a particular way (and this is quite a generic formulation) we may be able to detect these extra dimensions at the LHC. When I say detect, this actually comes down to studying the energy contect of the particles going into and coming out of the particle collisions. The hope is that in these collisions, the force carrying particle of gravity, the graviton, will be produced in vast numbers. These carry very little energy themselves but because so many will be produced, they may give observable effects. The idea is that these gravitons may be able to escape into the extra dimensions and the total incoming and outgoing energy of the particle collision will not be the same. Energy will appear to have been lost in the reaction, signalling possible extra dimensions. There's a lot more to it than this obviously but this is the basic idea. Anyway, the talk in Southampton on Thursday went through some of these scenarios in more detail and touched on some alternative theories such as technicolour and some of the various brane constructions which come about through string theory. Branes are like multidimensional sheets living in the ten dimensions of string theory and strings can become trapped on these branes. 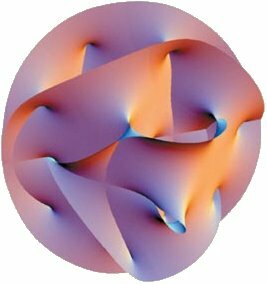 It is believed that we may live on a four-dimensional brane living in the ten-dimensional `bulk`. Anyway, I've waffled on enough. I shall stop for now but it was nice to go to a seminar even if it was a basic revue seminar, it's nice to get the brain in gear again. After all that physics talk I wanted to mention a book I've been reading recently. This is called Culture Shock: China, which is surprising me already by going against many of my preconceptions of the current and past Chinese culture. This may be partly a backlash on the author's part in reaction to the anti-Chinese sentiments often voiced by the West in relation to the political system, however it's an interesting insight into some of the propaganda that we may have been fed over the last ten years. For instance, the idea that one cannot disagree with government policy or even individuals in power is a false one. What is true however is that you cannot argue about the ultimate power of the party. This is a subtle but important distinction though how true it is, I guess I will find out when I'm there (not that I'm planning to push it). Religious expression is also allowed, again so long as it doesn't go against the rule of the party. As far as I can tell, this is no different from most other countries in the world. This may be a biased and naive view of the situation but it will be interesting to find out. It was great to meet up with a good friend, Ben, yesterday evening. Ben spent a few weeks in China and had a lot of very useful tips for me. From what he says, it's going to be a crazy two years but should be a lot of fun.